To purchase the Trumpeter 1/32 scale SBD-1 Dauntless scale model manual on printed paper click this PAYPAL button. 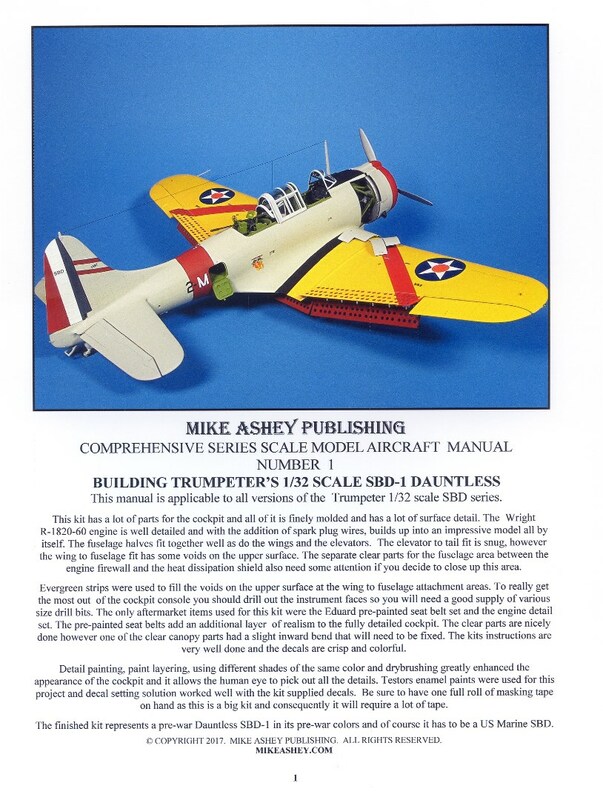 To purchase the Trumpeter 1/32 scale SBD-1 Dauntless scale model manual PDF click this PAYPAL button. This comprehensive series manual shows you how to assemble the kit in the proper sequence and paint detail the cockpit and the engine. Eduard’s engine detail set along with their pre-painted seat belts are added to the kit to enhance the level of realism. The manual shows you how to modify the pilots console so that the instruments can clearly be seen. The seam work necessary to address the seams on the wing and tail attachment points is demonstrated in step by step sequence along with tips on how to restore the surface detail. The manual shows you how to modify the cowling parts so that the engine detail can be displayed. The model is finished in pre-World War II Marine Corps colors.